Mayor David Bieter hosted a press conference on Wednesday, September 21, 2011 at 11:00 a.m. on City Hall Plaza announcing the official launch of The Speedy Foundation, a new non-profit formed by friends and loved ones of Jeret “Speedy” Peterson. The foundation is dedicated to understanding and preventing suicide through research, education, advocacy, and the promotion of activities and outlets for at-risk youths. At the event, The Speedy Foundation presented a $10,000 check to be used toward the creation of an Idaho Suicide Prevention Hotline. Idaho is currently the only state in the nation without a dedicated suicide prevention hotline. A coalition of Idaho organizations, including Idaho State University, Idaho Council on Suicide Prevention, Suicide Prevention Action Network of Idaho, Mountain States Group Inc. and Idaho National Guard, has created a detailed proposal for the creation of an Idaho Suicide Prevention Hotline. The Mayor was joined by representatives of The Speedy Foundation, the National Alliance on Mental Illness Boise chapter (NAMI), the Idaho Council on Suicide Prevention, the Mountain States Group, the Department of Veterans Affairs and other state partners. The event also help promote the annual NAMI Walk October 1st as well as provide information on existing suicide prevention resources for citizens and veterans. If there was any place off the ski jump that Jeret "Speedy" Peterson could call his own, it might have been Boise's City Hall Plaza. While still a high-school student, he contributed a tile to a mosaic artwork there that bears his name and a bold prediction: "Go for the Gold: Inverted Aerialist, 2002 Olympics." Last year, after he won the silver medal in the 2010 Olympics, Jeret himself was on the plaza, accepting the Key to the City and generously signing autographs and posing for photos with hundreds of fans. So it was with deep sadness that I joined suicide-prevention advocates on that spot again last week to announce the launch of The Speedy Foundation, an organization created in memory of Jeret and dedicated to understanding mental health conditions and preventing suicide through research, education, advocacy, and the promotion of activities and outlets for at-risk youth. According to a 2007 study, Idaho has the 11th highest suicide rate in the country. Suicide is the second leading cause of death for Idahoans ages 15 to 34 and for males age 10 to 14. A 2009 survey reported that one in seven high school students had seriously considered suicide in the previous year. Yet Idaho is currently the only state in the nation without a dedicated suicide prevention hotline. A coalition of Idaho organizations has created a detailed proposal for the creation of an Idaho Suicide Prevention Hotline. At the event, the foundation announced a $10,000 donation toward the creation of the hotline. 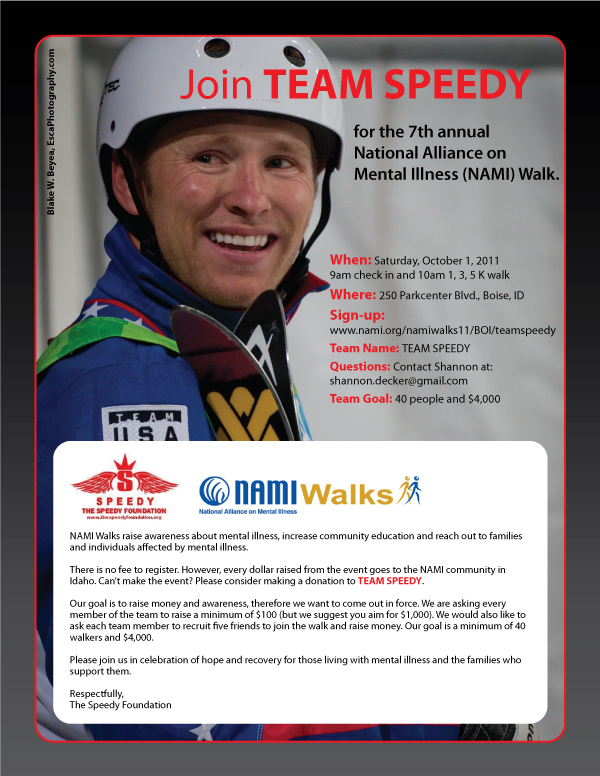 You can help this effort by supporting Team Speedy in this Saturday's NAMI Boise Walk. The 1K, 3K and 5K event begins at 9 a.m. at the Albertson/SUPERVALU headquarters, 250 Parkcenter Blvd. Jeret's tragic death has shined a powerful spotlight on the lack of sufficient mental illness resources in Idaho. The best possible legacy would be the creation of a permanent suicide prevention hotline in Idaho with an ongoing and sustainable funding source.